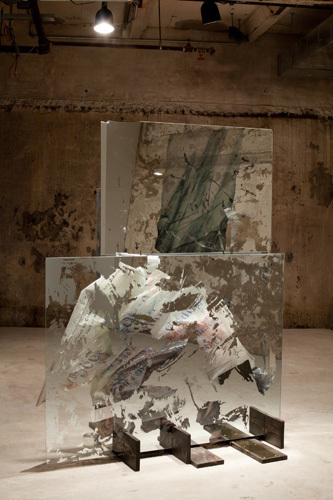 Valerie Snobeck, Weight, 2011, mirrors, peeled prints on plastic, image license, wood, door push, seaweed, screen protector, glass pitcher, 51 x 62”. In French “vide-poche” literally means “empty pocket,” but it also refers to objects that one uses on a day-to-day basis, and as such, the phrase has poetic allusions to the plenitude of detritus that shapes ordinary existence. In this exhibition, the expression is expanded to describe sculptural formations with the capacity to evacuate and shift meaning through ambiguity. The show opens with Samuel Clagnaz’s video Hat Shrine, 2008, a ribald statement in which he is seen building a shrine and then ritualistically worshipping a sculpture that comprises two plastic water bottles. In a wittily seditious gesture, the artist adorns the sculpture with furry headgear as blaxploitation music throbs (“Say my lady you are so fine . . . ”), and then he takes the sculpture’s place by dressing up in the adornments and sitting on the altar. In Weight, 2011, Valerie Snobeck exemplifies the show’s theme of relinquishing meaning through her use of two vintage mirrors. Between the two mirrored planes, a crumpled plastic sign is covered in faded colored text from old naval lunch menus and other odds and ends. The sculpture complicates and furthers the show’s theme through the combination of the viewer’s reflection and discarded material. In Moulages sur le vif (vide-poche) (Casts from Life [Empty Pocket]), 2009–10, Isabelle Cornaro produces large-scale prints depicting carefully organized clusters of objects, arranged as if they were under a microscope, on monochrome backgrounds. The items seem to have been randomly brought together as perhaps a collection of things in a thrift store might be assembled. In the end, we realize it is our job to reflect on and grasp the mercurial nature of these objects in order to resign ourselves to the plethora of meanings therein.